Depending on the year and Mother Nature, it could be mid to late March or sometime in early April when the sun melts the ice from the marina and it doesn’t take long for the word to get out that browns are biting! That’s because, well, after a long winter of being left alone, they ARE biting! They are cruising the shallow rocky shoreline of Lake Michigan feeding on gobies, stone rollers and other small baitfish that inhabit the structured shoreline. I like to pay close attention to my graph and the surface temperature as I’m trolling. I have found that often times, the areas where I get my bites are quite often patches of cloudy water where the water temperature can rise as little as 1 to 2 degrees. In those areas, the bait fish will tend to congregate and attract the hungry browns. When I find one of those patches, I will circle back and make several passes through that area and often pick up a fish or two with each pass through those cloudy patches. You will also find that the darker and more colorful baits, like firetiger and black/gold, will work the best in the cloudy areas as they tend to look the most like the gobies that the brown trout are feeding on. As a bonus, you may also pick up a few lake trout in the shallows in early spring. They too are cruising the rocky shoreline feeding on those same gobies that the browns are chasing. For this reason, I also like to toss out a couple orange/gold Rapalas in my spread. Lake trout love orange and there is nothing like a good lake trout filet on the grill from that early spring cold water! Since these browns and lake trout are in the rocky shallows feeding on gobies, I have found the downward swimming action of Berkley Flicker Shads and Flicker Minnows closely imitate the gobies and are quite deadly at times. I like the colors that closely resemble the gobies, like black/gold, black/gold sunset, slick sunset and firetiger. These also seem to work very well as the sun is coming up. After you’ve made those first couple passes in the real shallow water in the early dawn hours, you will notice the bite slow as the sun gets higher in the sky. This is when I like to slide out and work that 15’ to 30’ of water. The browns and lakers don’t go away, but they do get a bit sketchy in that clear shallow water and will tend to slide a bit deeper once the sun gets a bit higher in the sky. This movement opens up more options in my spread. I will trade a couple of planer boards for my slide divers and bust out a couple super light R & R spoons. Slide divers work great for this because I can dial them to run out from the boat and also put a 50’ to 60’ leader behind the diver. 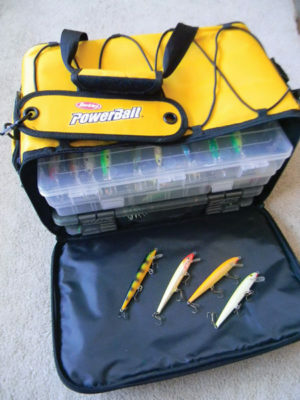 This is a deadly combination for these hesitant browns and lake trout. Being a little deeper also allows you use your downriggers if you have them. Just like the slide divers, I set my riggers with longer 60’ or even 80’ leads and run them shallow, like 8’ to 10’ down. By getting the baits back a ways from the boat, the browns, especially in the cloudier water, will be comfortable striking baits that far back from the boat. 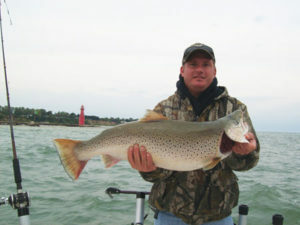 For current fishing reports or information on charter fishing check out my report page at www.FishAlgoma.com. From Captain Lee and the crew aboard the GRAND ILLUSION 2 – good luck and good fishing!